The NovelAire DH 100 was designed for demanding military applications where not only high performance but rugged construction and exceptional reliability are required. The DH 100 is a desiccant dehumidifier and performs effectively in conditions of very low temperature; temperatures at which a refrigerant dehumidifier is completely ineffective. Desiccant technology also allows this unit to lower the moisture content of air far below the level achievable by a refrigerant model. The characteristics which make this dehumidifier so useful in military applications are equally valuable in a variety of industrial settings. Typical applications for the DH 100 include storage rooms, vaults, and other small areas where items of high value and sensitive to moisture are stored, operated or processed. A desiccant dehumidifier adsorbs rather than absorbs water, a distinction made to separate the chemical process, whereby a desiccant material "captures" water molecules on its surface, from the physical process of absorption, as exemplified by a sponge soaking up water which enters small spaces and is retained by physical properties, including surface tension. This process is not compromised by freezing of the water, allowing a desiccant dehumidifier to operate at temperatures as low as 0°F, far lower than a refrigerant dehumidifier. The NovelAire DH 100 dehumidifier will extract 32 pints of moisture per day from the air at the AHAM testing standard of 80°F (27°C) and 60% relative humidity. 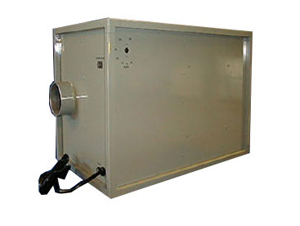 At lower temperatures and/or levels of relative humidity this unit will extract much less but it is precisely for these lower ranges of heat and moisture content that the DH 100 was designed. If an area contains materials that require a relative humidity as low as 20% to 25%, or dehumidification in near freezing or sub-freezing conditions, only a desiccant unit will achieve this. The DH 100 produces no condensate so drainage is not an issue. The slowly turning desiccant wheel adsorbs moisture and, if no action was taken, would become saturated. During every cycle, however, a portion of the wheel passes in front of a stream of warm air. The heat energy causes the water molecules to detach themselves from the desiccant and they are carried away by the air stream. The moist air must be ducted from the drying area to another part of the building, or outside the structure. The dried desiccant now resumes it water adsorption during the remainder of the cycle and thus continuously removes water from the air. The NovelAire DH 100 dehumidifier is a compact unit with a foot-print of just 16 x 25 inches and a height of 17 inches. This small size suits the unit ideally for its task of controlling humidity in smaller areas where space may be at a premium and suits it for mounting on a raised surface if this is more convenient. One of the advantages of a pure desiccant dehumidifier is its light weight, due to the absence of a compressor, condenser and evaporator found in refrigerant units. This light weight, combined with modest dimensions, makes this a truly portable dehumidifier. Ducting will, of course, need to be incorporated at any working location for the NovelAire DH 100 but this is a relatively simple operation. The DH 100 is an extremely durable dehumidifier having been designed for the rigours of military applications. Robust components are protected by a sturdy aluminium frame and panels to meet the challenges of severe operating conditions. Desiccant dehumidifiers are inherently more reliable than refrigerant units as their components are simpler and under less stress during operation. The DH 100 contains an integral humidistat to ensure that that relative humidity remains constant in the operating area. A remote humidistat is available if required.